Myriophyllum spicatum is a submerged aquatic plant that can rapidly colonise a pond, lake or area of slow-moving water. 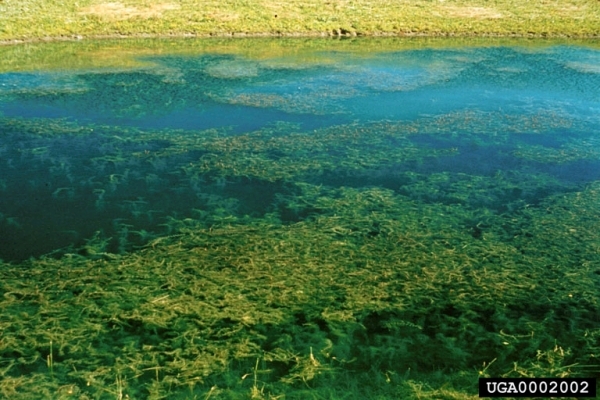 It creates dense mats of vegetation that shade out other native aquatic plants, diminish habitat and food resource value for fish and birds, and decreases oxygen levels in the water when the plant decays. A perennial, dicot herb with long branching stems and feather-like whorled leaves that is submersed and rooted to the substrate. Has small reddish flowers found above the water on a spike. 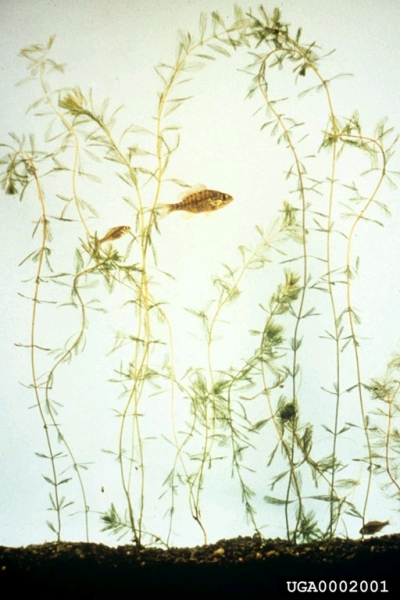 Stems are slender, smooth, 2- 6m long, reddish-brown to whitish-pink, and branch several times near the water surface. Leaves are olive-green, < 5cm. Long, soft, deeply divided, and feather-like. Each leaf has a central axis (midrib) with 14-24 filiform segments on each side. Leaf whorls arranged along the stems in whorls of 3 to 6 (usually 4) leaves. Whorl nodes approx. < a centimetre apart. Flower spike approx. 20cm long and held above the water with reddish flowers arranged in 4-flowered whorls along spike. Four petals, approx. 3mm long, 4 sepals, and 8 stamens. Four lobed fruit that splits into 4 nutlets. Fibrous roots that can develop on fragments of plants. An aquatic weed found worldwide. Prefers lakes, ponds, shallow reservoirs and low energy areas of rivers and streams. Brackish water of protected tidal creeks and bays. Common in waterbodies that have experienced disturbances such as nutrient loading, intense plant management, or abundant motorboat use. Able to tolerate a wide range of water conditions, including spring water and brackish water of tidal creeks and bays with salinity of up to 10 parts per thousand. Most often found in water 0.5 to 2.5m deep, but can be found at depths up to 3m. Tolerant to a range of temperatures, able to overwinter in frozen lakes and ponds in northern states and Canada; but also able to grow in shallow, over-heated bays in Florida. 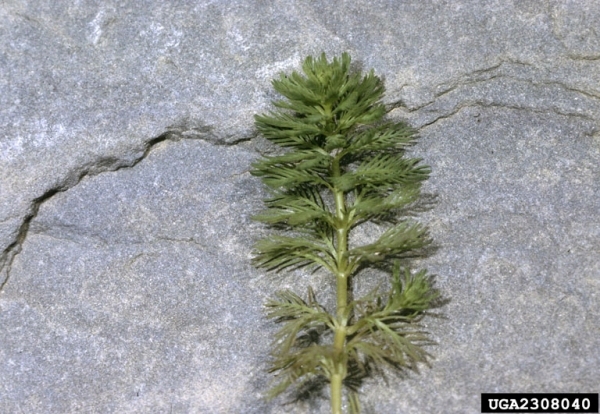 Myriophyllum spicatum can spread by sexual or vegetative reproduction with the majority of local reproduction by stolons and vegetative fragments. Average seed set of 112 seeds per stalk. Believed to be intentionally introduced in Washington DC in 1942Possibly introduced in the potting material for bait wormsInitial introduction may have been from an aquarium escapeTransport on boating equipment is believed to be the most common method of introduction to new areas. Recommended citation: Global Invasive Species Database (2019) Species profile: Myriophyllum spicatum. Downloaded from http://www.iucngisd.org/gisd/species.php?sc=278 on 21-04-2019. Myriophyllum spicatum grows into dense infestations which shades out and replaces other aquatic plants and is of less value as a food resource than the native plants it replaces. At high densities, it supports fewer aquatic insects which serve as a food resource for fish. Large predatory fish lose foraging space and are less efficient at obtaining prey. Another impact is a reduction in oxygen levels within the water due to the decay of the large mats of the plant. The dense mats impede water movement and interfere with recreational activities such as swimming, boating, fishing and water skiing. Physical: Mechanical choppers or harvesters can effectively remove large amounts of biomass in a short period of time, but caution should be taken because the plant pieces can spread the infestation. Harvesting must also be done up to several times per year. Roto-tilling of the plant and roots combined with underwater vacuuming has been used to control infestations. Water level manipulation using drawdowns has been effectively used to control populations in Tennessee. Bottom barriers that consist of specially made sheets of materials, such as fiberglass, polypropylene, or polyvinyl chloride (PVC), anchored to a lake bottom will prevent plant growth by blocking sunlight. Bottom barriers are most appropriate to control growth in localized areas. \r\nChemical: Aquatic herbicides may also be used but are rarely successful. \r\nBiological: Natural declines at the Northern lakes have been associated with a North American weevil, Euhrychiopsis lecontie, found to cause significant damage to Eurasian water-milfoil while having little impact on native species. The weevil could potentially be a biocontrol agent. Informations on Myriophyllum spicatum has been recorded for the following locations. Click on the name for additional informations. Collins, J.N, May M, Grosso C. 2003. 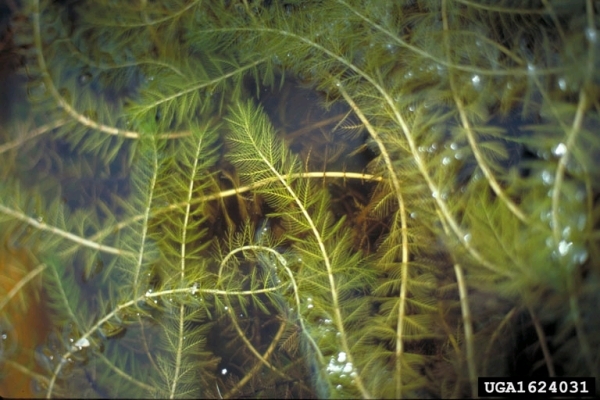 Eurasian watermilfoil Myriophyllum spicatum. Practical Guidebook to the Control of Invasive Aquatic and Wetland Plants of the San Francisco Bay - Delta Region. Available from: http://legacy.sfei.org/nis/milfoil.html [Accessed 22 May 2010]. National Park Service fact sheet. Summary: Brief description and natural history, as well as info on management options to control the species. Summary: General information including description, distribution, habitat, history, and reproduction. Management information about the response of the plant to different management options. Summary: Info sheet on ID of species, look-alike species, distribution, habitat, natural history, and management. Summary: Information on look-alike species.